The company will also work for the convergence between the beauty, bio and energy industry and the technologies of LG. It will develop star venture firms in K-Beauty, K-Bio and Zero-Energy that will be successful in overseas markets. With the aim of making inroads into the greater-China market, K-Beauty will support development of raw materials for cosmetics and product planning. 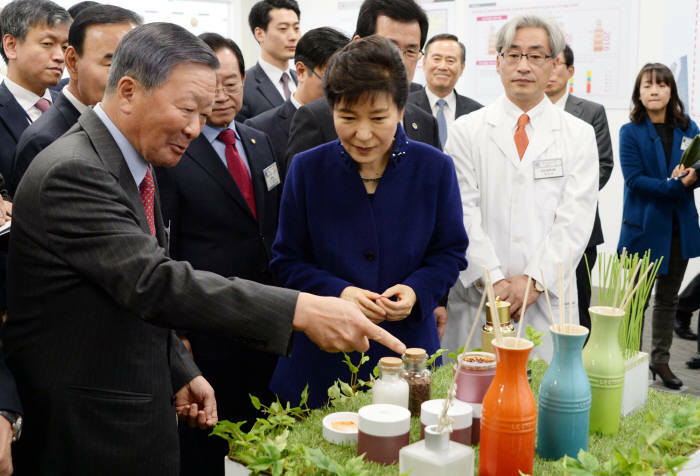 LG Household & Health Care will operate a network for developing cosmetics based on medicinal crops of Chungcheongbuk-do and take advantage of the cosmetics evaluation research center and the big data analysis platform to help them with overseas expansion. K-bio will be linked to the Osong High-tech Medical Complex. It will organize the bio mentor team consisting of current and former experts, and help small and medium-sized venture firms with their technology development and commercialization. LG will also make efforts to create the Zero-Energy ecosystem, i.e. make environment-friendly residential space. In Jincheon, Chungcheongbuk-do, the company will build the test house in the Zero-Energy testbed and provide Zero-Energy technology. Zero-Energy is a concept that encompasses the production of photovoltaics and high-insulation ESS (energy storage system) products. A total of KRW1,600 billion will be invested in the water treatment facilities in LG Chem’s Ochang plant, OLED materials and LG Hausys’ Cheongju high-insulation building and decoration materials facilities over a 3-year period. LG will provide the funds and ideas for invigoration of local startups. The company will raise a venture fund worth KRW150 billion jointly with Chungcheongbuk-do, the Financial Services Commission and the Small and Medium Business Administration. Also, it will open the ‘Idea Open Market’ so that small and medium-sized venture firms as well as prospective entrepreneurs can refer to the ideas of LG employees. The Idea Open Market comprises the ideas suggested in ‘LG-Life,’ an internal portal of LG. Ideas appropriate for SMEs will be opened. LG will also operate the Active Woman Business Center to help career-interrupted women find jobs.